Sensationalism and a frantic search for scoops are also part of art history. This applies generally to those rare artists whose names are widely familiar, the first being of course Leonardo da Vinci. New information appears on a regular basis, most with little scientific basis, providing amazing discoveries about him or his work. Endless nonsense has been written for example about the Mona Lisa. An article in The New York Times, the only credible publication to have uncovered what would seem to be a vast marketing operation for the artist’s four hundredth anniversary of his death, explains that in fact the scientists were unable to assert unequivocally that any of these people were directly related to Caravaggio, or rather to his brother or sister, who both died without children. The article adds that the tests were done on some of the inhabitants of Caravaggio, a town, with the same last name (Merisi). Not a month goes by without a sensational discovery about Caravaggio appearing in yet another headline. This time, a new painting by the master has been discovered. The firt mention appeared in an article in L’Osservatore Romano saying that a painting which is very probably by the artist was found at the Jesuits in Rome. There is an accompanying photograph, of poor quality, representing The Martyrdom of Saint Lawrence (ill.). It is of course impossible to acknowledge the master’s hand from just this document. From what we can see, this is an ambitious composition but the artistic quality simply is not there. Indeed, we cannot tell if this is just a detail from the canvas, or the entire work, in which case this is probably only a fragment. No information is provided about the size, provenance, background, the name of the art historian (s) who made the attribution to Caravaggio, if it will be published soon (and where) nor the opinions of Caravaggio, and Italian Seicento, specialists. In brief, once again another very hypothetical discovery has made media headlines. In France, we all remember the previous “Caravaggio” works found in Loches, still presented in this city as being originals (see news item, in French, of 26/1/06). Covering this kind of information always implies treading carefully : if not mentioned, we might be accused of not following the news. 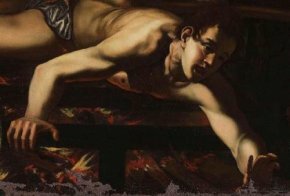 In this case, it has provided us with the chance to write an editorial…And since it is of course difficult to be critical without being criticized in turn, we present here our mea culpa, on the subject of Caravaggio to be more precise. We did indeed make a mistake by announcing in December of 2008 (see news item of 8/12/08) that the Caravaggio copy which had been stolen in Odessa had been recovered. Our information was based on foreign newspapers, notably Spanish, English and Italian, which at that time had published the news according to the RIA Novosti press agency, and which was undoubtedly false as the painting was in fact found last June in Berlin . What really matters is that it has been recovered finally, although this still does not make it any more an authentic Caravaggio than before. AP press release of 3/7/10. Le Monde, 17/6/10, with AFP. The Guardian, The Mystery of Caravaggio’s Death Solved at Last – Painting Killed Him, 16/6/10. AP press release of 14/5/10. Although we indicated that the foreign press had relayed this information, we did not state the original source clearly enough.